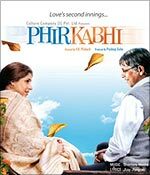 Phir Kabhi, a film about senior citizens starring Dimple Kapadia and Mithun Chakraborty, has music director Shantanu Moitra dolling out generous amounts of honeyed melodies, simply arranged and produced. Do not go by the first track of the album, Dekho Ji Dekho (Dibyendu Mukherjee, Sunidhi Chauhan) which sounds like a curious attempt at trying something that goes against Moitra's grain. Moitra is no Pritam (and thank god for that!) and should not succumb to producers forcing him to squeeze in a 'chartbusting dance track' or the likes. Come to Phir Kabhi which has Moitra reciting a few Bengali lines before Shaan taking off on a bluesy trip with moaning slide guitars and a raunchy bass line as an accompaniment. We do not know who has played the guitar in this number, but he certainly deserves to be commended. Moitra does his favourite Foxtrot (similar to the popular keherwa beat in Indian music) in Bhai Re. Now this rhythm, and more so the way the song is constructed over it, seems to be a particular favourite with the music director. He has used it for some of his most popular songs till date -- Khoya khoya chand, Pal har har pal among the others. As a result, there is a certain sameness to all these songs. You could either define this as being repetitive or cultivating a signature style, depending on how much you love Moitra's music. We think, this makes his repertoire seem somewhat limited. Jheeni Jheeni by Bhupinder Singh and Hamsika Iyer however is a gem of a song. It opens with the feel of an 80's love ballad (remember Glen Medeiros?) but smells of wet earth and evening ragas. Moitra uses the Swing rhythm with a more western arrangement for Hamsika's section and the Indian counterpart of the same (Dadra with simple tabla theka) for Singh's. The latter's deep voice and sombre rendition of his verses compliment Hamsika's sparkling, youthful ones beautifully. A very intelligently crafted duet. Ajay Jhingran's lyrics are consistently evocative, and his singing in Bhai Re has the right amount of earthiness and energy to it. Much like his last hit, Khoya khoya chand. Moitra is a man for nuances, and does a good job of evoking the old-world feel. The music of Phir Kabhi is more of the same. And that is bit of a letdown.